This uPVC ‘F'section is available in White and Brown. It is designed for use on the outside edges of conservatory roofs. It is designed to be used in conjunction with the Snap Fix Rafter Glazing Bar. It can also be used separately (without the Snap Fix Glazing Bar). 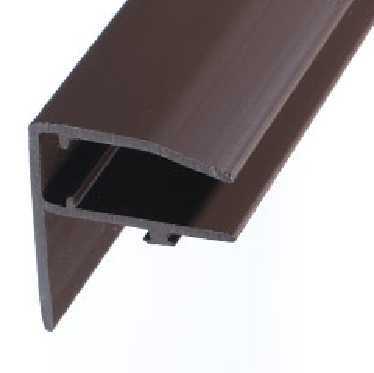 When used with the Snap Fix Rafter Supported Glazing Bar remove the gasket on the outside edge of the 10-25mm Snap Fix bar the uPVC ‘F’ section will slot into the aluminium glazing bar section. If you are using the 25-35mm Snap Fix Rafter Glazing Bar we recommend you use an aluminium ‘F’ Section. I would recommend your affordable products (Glazed Roof Components | uPVC Rafter Supported Snapfix Glazing Bars | uPVC F Section for 10mm thick glazing) to anyone else considering this product, as it has been superb. Omega Build Shop | Glazed Roof Components | uPVC Rafter Supported Snapfix Glazing Bars | uPVC F Section for 10mm thick glazing. You are viewing Glazed Roof Components | uPVC Rafter Supported Snapfix Glazing Bars | uPVC F Section for 10mm thick glazing, buy online today!